Wear your appliance as instructed at all times. It may be removed while eating, swimming, or playing vigorous sports activities. 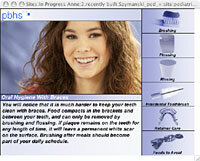 In two or three days your speech will return to normal with the appliance in place. Avoid flipping your appliance with your tongue. This can cause damage to your teeth or break your appliance.